Ever since I was young, I dreamt about what living in a castle would be like. Would I suddenly become royalty, with an arsenal of servants and noblemen to follow my every beck and call, of knights to fight for my honor? Would I suddenly be able to snap my fingers and summon a musician to play any tune I wanted, even if it was the instrumental to some Beyonce song? Could I rule the world? Okay, okay. Admittedly, my delusions of grandeur as a child had never risen to such ridiculous heights. My fascination for castles didn’t come from fantasies about owning dragons Daenerys-style, or inciting epic wars in my honor. Rather, my reasoning is far more simple: I fell in love with the architecture, the Old World charm of these gallant fortresses. Castles feel like time capsules rooted in modern time, each and every one painting individual stories. Below are a collection of my favorite chateaus all across America. 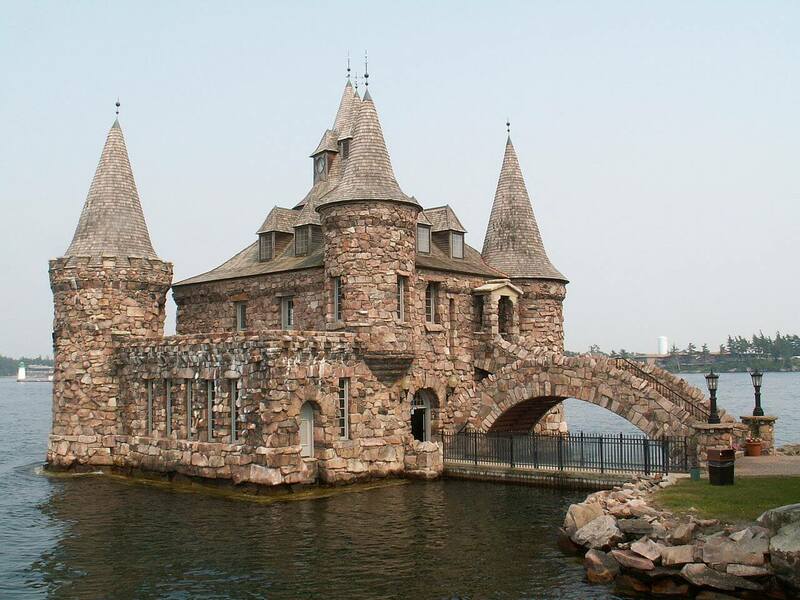 The story of the Boldt Castle is one entrenched in heartbreak. Beginning in 1900, George C. Boldt, millionaire proprietor of the prominent Waldorf Astoria Hotel in New York City, set out to build a dream project: a full size rhineland castle in Alexandria Bay, settled upon the gorgeous Heart Island—all for the love of his life, his wife Louise. Work on the castle begun immediately, George excited to complete the stunning 6-story, 120 room castle, fashioned with tunnels, a powerhouse, Italian gardens, a drawbridge, the Alster tower for children to play, and a dove cote. However, tragedy struck in the middle of the project, Louise passing away unexpectedly. George subsequently fell into depression, abandoning the project and never returning to the island. However, the will to keep the project going irrespective remained, the Thousand Islands Bridge Authority acquiring the property in 1977. Since then, several millions of dollars have gone into rehabilitation of the property. Today, the Alster Tower is referred to as the Playhouse, with architecture inspired by a defense tower similar to those used on the Alster River in Germany. Named after the Italian meaning “beautiful view”, the words couldn’t be truer. With two balconies, a gorgeous panoramic view of the city is available, revealing iconic trademarks such as: the Delacorte Theater, the Great Lawn, the Turtle Pond, and the Ramble. First conceived by Calvert Vaux in 1869, codesigner of Central Park, the castle was initially intended as a Victorian folly, sitting upon Vista Rock. And while providing incredible views to guests is a function the castle still does well, it also served another purpose: a station for for the U.S. Weather Bureau. The current weather station in Central Park, an Automated Surface Observing System (ASOS) located just south of the castle, with wind equipment still being located in the main tower. Additionally, the castle now serves as a visitor center and gift shop, with free family and community events such as birding and other natural history programs. Hammond Castle is a Medieval-style castle located in the fishing village of Gloucester, built by John Hays Hammond Jr. between 1926 and 1929. He was a prolific inventor and creator, and had even meritted himself the name “Father of Radio Control” for his extensive work in the field. His creation, Hammond Castle, sits dreamily upon a bluff overlooking the Atlantic Ocean, bringing a unique blend of art, architectural elements, and culture (Hammond having spent time in both Africa and England as a child). He appreciated eras that spanned Ancient times, the Medieval period, and Renaissance. He purchased a collection of varied artifacts, and created his residence around grandiose stone archways, windows, wooden facades, and other Old World architectural elements. Because of this, guests can truly enjoy the essence of what Europe was thousands of years ago, without actually being there. There are a plethora of gorgeous castles not only in the United States, but around the world, each with their own exotic history. And while you unfortunately cannot own the properties listed in this article, there are plenty of enchanting castles for sale in the USA.